The BBC has launched a beta version of its popular iPlayer showing off new features like the ability to share favourite programmes via social networks such as Facebook and Twitter. Users are invited to log in to the online player to take advantage of the new personalisation options, and enjoy the ability to link in with Twitter and Facebook while getting down to EastEnders. Once logged in, users can see recommendations based on prior viewing habits and even chat with chums over Microsoft’s Messenger service while watching live TV streams. A new “adaptive bit-rate system” promises to continually adjust video to match changes in individual broadband connections to improve the streaming quality, and the iPlayer will eventually be able to to take data feeds from other catch-up services including 4OD, Demand Five, ITV Player, SeeSaw and Welsh broadcasters S4C and Clic. 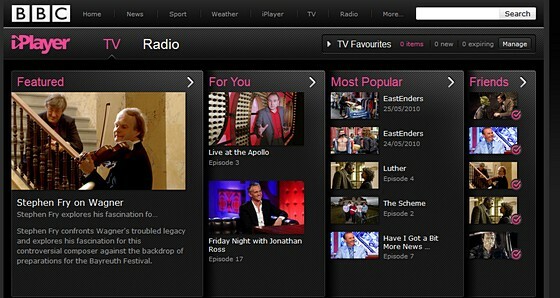 Give the beta iPlayer a go here.